Southern California Edison Big Creek is a large hydro-generating facility in the Sierra mountains of Southern California. About three years ago, it was apparent to management that the forces of deregulation in the power generation industry would necessitate the need for greater machine reliability, availability and extended operating life, while simultaneously reducing maintenance and operating costs. This led Big Creek managers to implement an aggressive program of condition-based maintenance (CBM), including on-site oil analysis. The fundamental objective of the program was simple, generate more profit through improvements in productivity. Before beginning the transformation, those responsible for implementing the CBM program sought education about oil condition control and oil analysis. 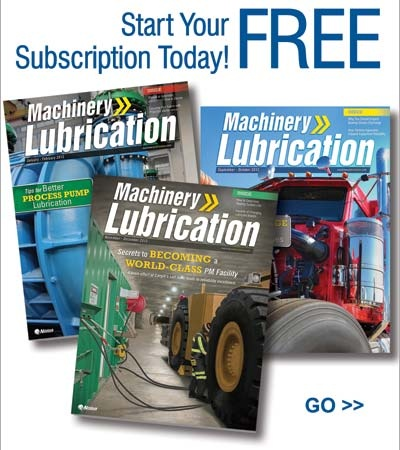 The education process identified specific opportunities for improving the life of mechanical equipment through effective control of the lubricant condition, and especially, through the control of damaging contaminants. The education also revealed how oil analysis can detect problems occurring in the lubricant or machine. Education is the critical first step to ensure that one does not proceed blindly into implementation without a clear definition of the opportunities and pitfalls. This article summarizes the conditions prior to and since the implementation of CBM and contamination control, with emphasis on the steps taken to achieve the improvements. The Initial Situation at Big Creek. After learning about the benefits of lubricant condition monitoring and control, a survey of practices at Big Creek revealed a number of key opportunities available that could have a dramatic impact on the life and reliability of equipment. Before implementing the CBM program, maintenance activities were primarily comprised of corrective maintenance and scheduled activities. An example of a scheduled activity is the annual process of inspecting and reworking the bearings on the impulse generators. Each year, the bearings were intrusively inspected by removal of the lower bearing halves to inspect the bearing and journal. The procedure was a combination of visual inspection and gap measurement. If the bearing was nonconforming to pre-established standards, it was scraped, reworked, reinstalled and re-inspected before being returned to service. Costs and manpower requirements for inspection and rework were significant and are estimated in Table 1. Contamination control measures at the plant were nearly non-existent. Beyond simple centrifugal filter press units, little was being done to control the presence of destructive contaminants. In fact, initial contamination levels were beyond the sensitivity limits of the particle counting instrument they acquired for on-site condition monitoring, above an ISO 25/22. This stands to reason given the long history of scheduled maintenance at the plant. When machines and components are routinely inspected, replaced and re-worked, the demand for aggressive control of failure root causes, like contamination, is quite low. However, changing strategic objectives due to deregulation demanded a new focus to meet tactical goals of extending time between inspections and condition-driven corrective maintenance. Figure 1 - Newly installed off-line filter for generator bearing oil with sample port conveniently attached upstream of the filter. Previously, oil analysis and lubricant condition monitoring was limited to a visual inspection of the oil. If it looked clean, clear and bright, it was retained in service. Of course, damaging contaminants, it was learned, are too small to be seen with the naked eye. In fact, the most dangerous particles that impede the clearances between moving surfaces are typically five microns to 20 microns in diameter. The naked eye can see nothing smaller than a 40-micron particle. Even 40 micron particles are difficult to see, except under ideal conditions. Typically, particles over 80 microns in diameter are the first ones seen under visual inspection. These particles usually accompany a very advanced condition of wear, when it is too late for preemptive action. Likewise, visual analysis of the oil is also limited to only identifying haziness caused by high levels of moisture, often past the danger point, or darkening due to advanced states of lubricant oxidation and breakdown. • Installation of circulating pumping systems and filters - regular, full-time filtration systems were installed on critical fluid systems (Figure 1) including storage tanks for high-pressure oil, governor oil sumps and stand-alone submersible oil pumps. 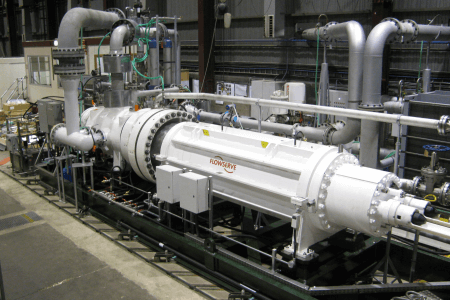 Portable oil conditioning systems are also used to amend the full-time installations. • Use of progressively finer filtration - Beginning with 25 micron filters, working down to 3 micron filters, the systems were cleaned up to very tight tolerances. • Setting aggressive cleanliness targets - Initial targets of ISO 16/13 were set for the systems. These targets were achieved and re-set to ISO 14/11. These targets were achieved and re-set to ISO 13/10. • Implementation of lubricant condition monitoring - Condition monitoring ensures that targets are maintained. Without the feedback mechanism, a system can not be considered a "controlled" system. Because the objective was to establish lubricant condition control, onsite monitoring of particle counts, viscosity and moisture screening was deemed necessary (Figure 2). It ensures that the oil is clean and healthy. Onsite monitoring also identifies abnormal wearing conditions so the situation can be analyzed and corrective measures scheduled…on-condition. • Integration of condition monitoring - Lubricant condition monitoring alone cannot do the job. At Big Creek, vibration analysis is also employed to ensure proper alignment and balance, and to detect wear and abnormalities not seen by lubricant condition monitoring. Also, thermography is used for electrical systems and as backup for analyzing mechanical wear situations. As a kit, lube condition, vibration and thermography make a synergistic combination. Results and Conclusions. The implementation has been a complete success. By employing machine condition control and monitoring, scheduled inspections have been eliminated. At just one facility, bearings of the impulse generators have not been opened up in over two years. This has led to the savings of nearly 350 inspection related man-hours, not to mention the elimination of bearing reworks, lost productivity, and the problems caused by opening up the systems. Figure 2 - On-site oil analysis lab provides particle counting, viscosity analysis, and moisture analysis. Contamination control and onsite analysis are expected to pay-off big in the coming years. Controlling contamination slows the abrasive process that wears out mechanical systems. Table 2 illustrates the improvements in oil cleanliness during the implementation process. In going from an ISO 25/22 to ISO 16/13, over 99% of the abrasive particles were removed. As a consequence, according to research, this system should experience 85% reduction in wear rate. This translates to an approximate 550% increase in life, assuming all other things are held equal. The additional improvements in fluid cleanliness further extend the life of these components. Another benefit of maintaining the super-clean ISO 13/10 cleanliness is that operating abnormalities are very readily seen at this level. At the original ISO 25/22 levels, an increase of 1,000 particles larger than 10 microns/ml due to abnormal wear condition provides a data signal rise of only 1.2%. It might be hard to detect a problem with a change that small. However, at an initial level of ISO 13/10, the same increase of 1,000 particles creates a relative change of 7,142%, a very noticeable trend spike indeed! In terms of more savings, at the Eastwood Power Station, an underground pumped/storage hydro facility, contamination control has really paid off. Historically, dirty oil was the cause of frequent stiction and failure of the hydraulic shuttle valves that control the transition between pumping and generating. A failure of this nature can occur at anytime, is instantaneous and takes the unit off-line. In response, the repair crew must travel to the site (an hour each way), disassemble the valve, repair it and bring it on-line. In addition to labor, at peak time, the cost can be as high as $200 per MWH in lost production. Since installing fine filtration and onsite contaminant monitoring, only one failure has occurred, and it was due to varnish on the valve. This improvement has saved hundreds of man-hours. Over time, it will yield hundreds of thousands of dollars in increased profit to the organization. The forces of deregulation will have a profound affect on the power generation business. Through an aggressive CBM program that includes contamination control, on-site oil analysis, vibration and thermography, Big Creek is taking proactive measures to improve availability while decreasing the costs associated with equipment maintenance. In doing so, the maintenance organization is aligned with corporate objectives to improve productivity. More for less is a great combination!